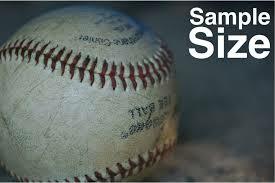 1st 10 | of Spring Training stats and small sample sizes . . . So, if there was ever reason not to put too much stock into EITHER Spring Training stats OR the first two starts of the regular season for the rotation, this would be it . . .
J.A. ~ surprise of the bunch! not so great tidbit from Gary Hill . . .
~ Nelson and Ack are really the only starters to have carried over a great spring into the regular season. ~ Robbie, Kyle, Brad and Austin are off to very slow starts after decent springs. Trying to assess them in spring, other than health, is an effort in futility with the small amount of work they get. That said . . .
~ The Bartender is on the 15-day DL (due to come off soon – supposedly nothing serious – some sort of collision with Danny in stretching drills). ~ Here’s hoping that Nando got his bad roller coaster endings out of the way early! So, that’s the first TEN in a nutshell. This entry was posted in Rosy's Ramblings. Bookmark the permalink. ← g10 | always a missing piece . . .